PREMIUM QUALITY Lemongrass OIL: 100% Pure, Natural, Therapeutic Grade. Steam Distillation of fresh lemongrass. Non-Toxin, No Additives, No Fillers, Unfiltered and Undiluted. Vegan certified, paraben free and cruelty free. 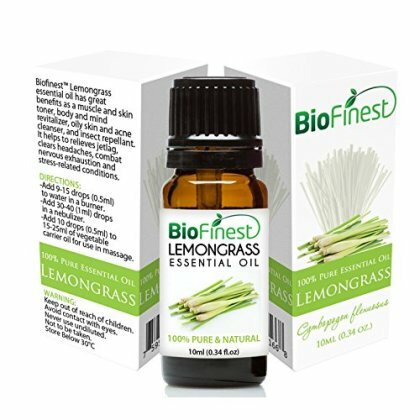 AMAZING AROMATHERAPY EXPEIRENCE- Add a few drops of Biofinest Lemongrass Oil into your oil diffuser to inhale the ultimate serenity while refreshing the room with the crisp scent of Lemongrass Oil. This spectacular scent will also open your airway and fill you with an invigorating fresh, renewed feeling. RELIEVE STRESS, DEPRESSION AND ANXIETY: Lemongrass has a light, fresh, citrus aroma with earthy undertones. Refreshing, rejuvenating, stimulating, and balancing, it inspires and improves mental clarity. Lemongrass is also known to help support the circulatory system.